With the creation of the federal Opportunity Zones incentive program, trillions of dollars in new private investment will flow into pre-designated low-income communities around the country. But will this investment benefit the people living in these communities now, or will they be displaced as new interest and development brings increased property values and rents? And what kind of development will result —unsustainable, car-dependent sprawl (the dominant growth paradigm in the United States today) or walkable, mixed-use communities with a variety of housing options for everyone? 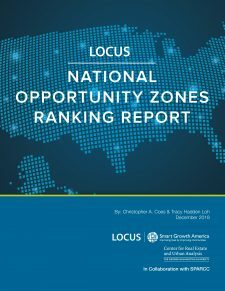 This new LOCUS report—National Opportunity Zones Ranking Report—identifies which Opportunity Zones are positioned to bring positive social, environmental, and economic returns, by ranking all Opportunity Zones by their smart growth potential and current social equity. Second, the report includes policy recommendations for communities to ensure that development results in more walkable places that are healthy, prosperous, equitable and resilient. Use the tabs below to explore the report and more about Opportunity Zones. The LOCUS National Opportunity Zone Ranking Report, first of its kind, ranks each of the designated Opportunity Zones based on its Smart Growth Potential (SGP) as well as Social Equity + Vulnerability Index score. This research has revealed a tale of two zones: a majority of Americans in Opportunity Zones live in communities that force them to pay higher housing and transportation costs while being subjected to higher negative social and health impacts and a lower quality of life. The magnitude and scale of this tragedy is a reality check that the Opportunity Zone tax incentive is not a silver bullet. However, if leveraged properly with a robust, long-term funding and policy framework from all layers of government, this tax incentive could address decades of poor land use, institutional inequities, and development decisions to instead improve the quality of life for many Americans. The report ranks Opportunity Zones for smart growth potential based on on four metrics—walkability, job density, housing diversity and distance to the nearest top 100 central business district—to generate a final score ranging between 0 and 20 indicating how “like” a walkable urban place (or WalkUP) the zone is. We defined SGP Opportunity Zones as zones with a minimum SGP of 10. For Social Equity + Social Vulnerability, we used four different variables—transit accessibility, housing and transportation affordability, diversity of housing tenure and, social vulnerability index—to generate a final score ranging between 0 and 20. The score of 10 is the minimum score to be designated a SEVI opportunity zone. The top scoring Opportunity Zones with high social equity and vulnerability are Downtown Oakland, Downtown Seattle, Downtown Portland, Downtown Newark, and the International District in Seattle. These Opportunity Zones are the most vulnerable for accelerated gentrification without place and people-based policies to protect them. SGP and the Social Equity/Vulnerability Index go hand in hand. The study revealed the extreme dichotomy of the two worlds of America. Only 0.18 percent of Americans live in both a High Opportunity and High Equity Opportunity Zone. Today, these zones are considered both walkable urban places and socially and economically inclusive. Nearly 2⁄3 (approximately 21 million residents) of Americans in designated Opportunity Zones live in communities that received the lowest scores in both walkability and social and economic inclusiveness. The Equitable Investment Atlas is an interactive mapping tool that allows users to search all designated Opportunity Zones in the 50 U.S. states and the District of Columbia for information regarding their Smart Growth Potential (SGP) and Social Equity. It is intended to guide communities in designated Opportunity Zones, as well as other stakeholders and investors, to better understand designated zones’ SGP status relative to other locations across the country. SGP is calculated based on four metrics—walkability, job density, housing diversity, and distance to the nearest Top 100 central business district—to generate a final score ranging from 0 to 20 and indicating how “like” a Walkable Urban Place (WalkUP) the zone is. An SGP score of 10 is the minimum score to be designated an SGP Opportunity Zone. The Atlas also calls out the location and characteristics of the nation’s “Bubble Communities,” places whose SGP and Social Equity score between 7 and 11. These communities stand out from other classifications due to the fact that they are most in control of their future, but could experience the fastest rapid change in social equity or economic performance if they are intentional about their investment and policy frameworks. To ensure the Opportunity Zones program delivers on its promise to benefit distressed communities, LOCUS and Smart Growth America are fully committed to helping those communities guide equitable development and investment. What are Opportunity Zones and where are they? What’s in them and who calls them home? What type of investment and revitalization opportunities are available in each Opportunity Zone, based on their various economic, environmental, demographic, housing, and infrastructure characteristics? If you’re interested in participating in real estate, policy, and business, economic, and community development activities in our nation’s newly designated Opportunity Zones, download the report. Click here to access a larger version of the Equitable Investment Atlas. Click here for a comprehensive data dictionary. The map loads with the Opportunity Zone boundaries symbolized by their Smart Growth Potential. To view Social Equity, use the legend to check off the Smart Growth Potential layer and check on the Social Equity layer. To zoom to a specific location or address, click on the grey magnifying glass in the lower left corner of the map. A population count that is responsive to the geography of the map and any filtering of Opportunity Zones in the subsequent graphs. A count of the number of each type of Opportunity Zone (for example: low social equity, high smart growth potential). Clicking on one of these categories will show only this type of Opportunity Zone on the map, and update the population count to show the population in just those census tracts. To release a filter, click “All” in the upper right corner of the graph. Two histograms of the distribution of Smart Growth Potential and Social Equity in the map’s area. Clicking on histogram bars will update the map to include only tracts within that bar and update the population count. To release a filter, click “Clear” in the upper right corner of the graph. The map loads with boundaries of WalkUps displayed with an orange outline. The layer can be checked on and off in the legend. The LOCUS Opportunity Zone Navigator is an interactive mapping tool that allows users to search designated census tracts for transit, environmental, economic, housing, and affordability information. It is intended to guide Opportunity Zone stakeholders in better understanding the economic, environmental, demographic, housing, and infrastructure characteristics of a designated Opportunity Zone census tract and in turn, the type of development that will maximize public and private returns on investment and benefit the residents there. Click here to access a larger version of the Opportunity Zone Navigator. Click here for instructions on how to use the Opportunity Zone Navigator. On December 20, 2017 the Tax Cuts and Jobs Act created a new community development program aimed at encouraging long-term private capital investment in America’s low-income urban and rural communities. Introduced by Senators Cory Booker (D-NJ) and Tim Scott (R-SC), the federal Opportunity Zones program provides three scalable tax incentives for investors to re-invest their unrealized capital gains into Opportunity Funds dedicated to investing in distressed communities. In early 2018, the governor of every U.S. territory and state, as well as the mayor of the District of Columbia, nominated 25 percent of the total number of low-income census tracts in their respective jurisdictions as qualified Opportunity Zones; the U.S. Treasury subsequently approved designations of 8,762 Opportunity Zones in all 50 states, the District of Columbia, and five U.S. territories. Account for nearly 12 percent of America’s land mass. Are home to over 30 million Americans, 56 percent of which are demographic minorities. Have a 30 percent poverty rate and house residents earning, on average, 59 percent of AMI (Area Median Income). Employ 73 percent of residents in commercial jobs and 27 percent in industrial ones. Only 9 percent of already-designated Opportunity Zones have at least one transit station. 77 percent are located within the 300 largest Metropolitan and Micropolitan Statistical Areas and the remaining 23 percent are located in rural census tracts. The Opportunity Zones tax incentive is beneficial to both communities and investors. Under the terms of the program, communities will receive access to mission-oriented and patient capital. Meanwhile, anyone with access to capital gains, especially private developers and investors, will be able to concentrate capital in areas of most need, hold a stake in communities’ futures, and align their payoffs with community success. 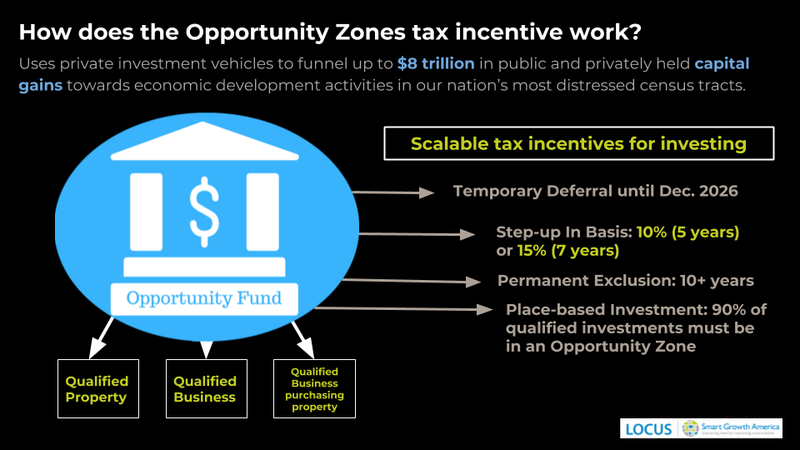 The core of the new Opportunity Zone program is three scalable tax incentives designed to encourage long-term investment into distressed communities through qualified Opportunity Funds. By statute, a qualified Opportunity Fund is a private investment vehicle organized as either a corporation or a partnership that invests or holds at least 90 percent of its assets in a qualified Opportunity Zone business or property. These corporate and partnership investments must be made in cash and cannot be in-kind contributions or promissory notes. The eligible activities and projects that the Fund can support are broad, from commercial and industrial real estate, to housing, infrastructure, and existing or start-up businesses. Opportunity Funds may support either Opportunity Zone businesses or Opportunity Zone business properties. The business is not a private or commercial golf course, country club, massage parlor, hot tub facility, suntan facility, racetrack or other facility used for gambling, or any store the principal business of which is the sale of alcoholic beverages for consumption off premises. During the qualified Opportunity Fund’s holding period, almost all of the use of the property was in a qualified Opportunity Zone. In October, the IRS released its first round of proposed regulations on Opportunity Zones. This is the first of several proposed federal regulations and guidance documents expected to be released before tax filing begins in 2019. The proposed regulations addresses ​key issues like self-certification, qualified Opportunity Zone businesses, and valuation of Opportunity Fund assets. The IRS also released a Revenue Ruling providing clarification on the substantial improvement of existing buildings purchased by Qualified Opportunity Funds. See LOCUS’ complete summary of the IRS’ proposed Opportunity Zone regulations here. The IRS is seeking comments on the proposed regulations until December 28, 2018 and has scheduled a public hearing for January 10, 2019. If you would like to join LOCUS and other stakeholders in submitting a letter during this period, please contact LOCUS at [email protected]. Provide incentives to encourage the formation of equitable Opportunity Funds. Develop performance-based metrics, such as equitable development scores, to ensure that Opportunity Funded projects are positively improving lives and transforming place. Establish community-based Opportunity Funds by pooling existing community development dollars to attract diverse equity partners, including public employees, local pension funds, and crowdsourced funders. Designate staff to serve as an one-stop-coordinating office and point of contact for interested investors and businesses to manage open data, investment strategy, resources, and reporting. Staff can also serve to provide resources for local businesses by connecting them with Community Development Finance Institutions (CDFIs). Leverage capital through federal Community Development Block (CDBG) grants, providing Tax Increment Financing (TIF), or Payment in Lieu of Taxes (PILOT) awards for small businesses in target locations. Build a network of local banks devoted to small business growth and initiating an entrepreneur loan fund, potentially in partnership with business training or financial literacy programs. Engage local non-profit organizations that work directly with businesses owned by people of color, women, and local immigrant populations to build inclusive networks and services. Build partnerships with anchor institutions that commit to purchasing a minimum percent of supplies or services from locally-owned and operated businesses. Work with workforce development programs to help qualified Opportunity Zone businesses find local hires, and showcase local employment opportunities through internships, events, and school trips. Plan for a mix of affordable housing downtown so that people can afford to live near their jobs and employers can better recruit and retain people. Update zoning codes to facilitate mixed use. Encourage development near transit. The land around transit stations is a critical asset that should be developed and marketed to meet community goals. Develop a comprehensive investable project pipeline that creates long-term housing and transportation affordability while accelerating job creation. Institute an inclusive community engagement process for prioritizing and developing projects and initiatives. 1. Adopt equitable development investment frameworks and strategies that are appropriate for a location’s SGP and maximize the triple bottom line (people, planet, and profit) there. 2. Engage the community to assess ideal locations for investment and ensure community buy-in. 3. Diversify stakeholders to include representation from low-income and minority communities as early as possible; encourage minority and female-led businesses to participate in fund leadership. 4. Prioritize equitable investments that consider local communities’ walkability to transit and local amenities. When can investments in new Opportunity Zones start to take place? Investments in Opportunity Zones were allowed to begin as soon as the Tax Cuts and Jobs Act was signed into law in December 2017. Why is the Opportunity Zones tax incentive attractive? The Opportunity Zone program allows investors to defer tax on prior capital gains until the earlier of the date on which an investment is sold or exchanged, or December 31, 2026—so long as the gain is reinvested in an Opportunity Fund. Additionally, if an investor holds their investment in the Opportunity Fund for at least ten years, they would be eligible for an increase in basis equal to the fair market value of the investment on the date that the investment is sold or exchanged. For more information on how investing in Opportunity Funds compares to investing in a traditional stock portfolio, visit the Economic Innovation Group’s Investment Scenarios resource page. What is the difference between an Opportunity Zone and a low-income census tract? An adjacent census tract? Every Opportunity Zone is a low-income community. However, every low-income community is not an Opportunity Zone. Low-income community census tracts are defined by Section 45D of the Internal Revenue Code. The term applies to any census tract where the poverty rate is at least 20 percent, or the median family income there does not exceed 80 percent of the surrounding area’s. Adjacent census tracts are those census tracts that do not qualify as low-income community census tracts but that are contiguous with designated Opportunity Zones. The median family income there does not exceed 125 percent of that Opportunity Zone. No more than five percent of the total number of designated Opportunity Zone tracts in a state can be adjacent census tracts. Are there going to be future rounds of Opportunity Zone designations? No. The Opportunity Zones program was written into the Tax Cuts and Jobs Act as a 10-year program and is set to expire on December 31, 2028. What is the cutoff date for investing in Opportunity Zones? Investors can continue to invest in Opportunity Zones until the program is set to expire—December 31, 2028. However, OZ tax incentives are tied to the length of an investor’s stake in an Opportunity Fund, providing the most benefits to those that hold their investments for at least 10 years. Who can implement “Do No Harm” policies in Opportunity Zones? State and local governments can institute policies that protect vulnerable populations and existing businesses in Opportunity Zones. Opportunity Funds can also incorporate equitable development and investment frameworks into their mission and operation. How can communities prevent commercial and residential displacement from occuring as investment rises in new Opportunity Zones? The key to preventing commercial and residential displacement in new Opportunity Zones is to act now; local governments can establish localized policies and practices within which they would like the Opportunity Zones program and any arising Opportunity Funds to operate. First, localities can institute “Do No Harm” policies that protect vulnerable populations and existing businesses from displacement. These can include establishing performance-based Opportunity Fund metrics, such as equitable development scores, or a one-stop Opportunity Zones coordinating office that aligns all state and local regulatory agencies in overseeing the program’s operation. Communities can also ensure that their residents buy into the Opportunity Zones program and own the program’s wealth-creating opportunities by crowdsourcing placemaking and recruiting and training residents and businesses to become investors in their own communities. How can community development nonprofits already working in newly designated Opportunity Zones make the most of the program? Local advocates and non-profit organizations can direct their existing capacity, knowledge of local practices, and partnerships towards creating a responsible business and policy environment for the Opportunity Zone program to operate in. These groups can encourage their local governments to adopt “do no harm” policies, recruit and train local residents and businesses to become investors in their own communities, compile a local project pipeline of mission-driven projects for investment, and align with like-minded organizations to sponsor or invest in an Opportunity Fund. How will the success of the Opportunity Zones program be measured over time? Who can establish and/or invest in an Opportunity Fund? Any individual or organization with access to capital gains or equity partners who hold them can establish and invest in an Opportunity Fund. This includes, but is not limited to: real estate development and investment companies, banks, corporations, community development financial institutions, state and local governments and agencies, foundations, nonprofits, and private individuals. How do you establish an Opportunity Fund? Opportunity Funds will be self-certified and will not require any application to or approval by the U.S. Treasury or IRS. To self-certify, a participating taxpayer will complete a form and attach it to their federal income tax return for the taxable year. Can an Opportunity Fund participate in the financing of public projects, such as infrastructure? Yes, an Opportunity Fund can participate in the financing of public projects. The legislation is written to encourage investment in operating businesses, equipment, and real property—such as real estate and infrastructure. Any infrastructure must be used in the active conduct of a business. The original use of any infrastructure must begin with the Fund or the Fund must substantially improve that infrastructure. What types of capital gains can be directed into an Opportunity Fund? Capital gains are the profits earned from the appreciation in value of a prior investment, such as a stock, bond, or real estate asset. Any of these types of earnings can be directed into an Opportunity Fund. Can multiple Opportunity Funds be established in one Opportunity Zone? Yes. There is no limit to the number of Opportunity Funds that can be established in each Opportunity Zone. Yes. An Opportunity Fund must invest at least 90 percent of its assets in qualified Opportunity Zone businesses or properties. These businesses and properties can be in one Opportunity Zone or spread out across multiple zones. Do Opportunity Funds have to be community development financial institutions (CDFIs)? Opportunity Funds are not CDFIs. They are unique to Opportunity Zones, while CDFIs can operate in all of America’s low-income census tracts. However, an existing CDFI can either create or become certified as an Opportunity Fund. Both the CDFI and Opportunity Zones programs aid economic development in America’s low-income communities. However, CDFIs have traditionally funded small-scale projects by providing financial products and services, such as credit, loans, and access to financial education, to local residents and businesses. Opportunity Funds are intended to facilitate larger-scale, longer-term development by providing equity for real estate, economic, and community development activities. With their already existing project-pipelines and close relationships with local development and investment stakeholders, CDFIs are uniquely positioned to run, manage, or sponsor new Opportunity Funds. They can take the lead on creating an Opportunity Fund’s legal and management framework, carry out its capital formation, and serve as a guiding force on deploying its assets. Are Opportunity Funds exempt from Davis Bacon? Yes, Opportunity Funds are exempt from Davis Bacon. They are not subject to federal prevailing wage. How can an investor cash out of an Opportunity Fund? Opportunity Fund exits strategies are fund-specific. It is the responsibility of a fund’s management and investment team to determine their exit strategies upon setting up their corporate investment structure. This will likely depend on a fund’s investment type (housing, TOD, infrastructure, etc.) and timeline. If an investor would like to opt out of the fund before it is due to close, a process should be determined by the fund’s manager upon creation of that fund. More questions? Send them to [email protected]. Federal Opportunity Zone Law, hosted by Sills Cummis & Gross P.C. Are you a real estate company or local government seeking guidance on how to navigate the Opportunity Zones program? Conducting project and pipeline reviews to determine Opportunity Fund feasibility. Determining eligibility for the Opportunity Zones program, as well as other federal funding programs such as RRIF (Railroad Rehabilitation & Improvement Financing), TIFIA (Transportation Infrastructure Finance & Innovation Act), and Brownfield Cleanup Grants. Putting together and guiding clients through the federal funding application process. Reviewing and determining potential Opportunity Fund structure and investment parameters to meet federal guidelines and ensure best outcomes. Identifying and resolving U.S. Treasury certification issues. Identifying and selecting fund managers, investors, and complimentary capital sources. Contact Christopher Coes, LOCUS Director, at [email protected] for more information. For immediate Opportunity Zones program inquires, contact Tola Myczkowska at [email protected]. Foot Traffic Ahead (2016) shows that metros with the highest levels of walkable urbanism are also the most educated and wealthy (as measured by GDP per capita) and surprisingly, the most equitable. A resource for local elected officials who want to reinvigorate and strengthen neighborhood centers of economy, culture, and history through a smart growth approach to development. The IRS’ first round of proposed regulations on Opportunity Zones provides guidance on key issues like self-certification, qualified Opportunity Zone businesses, and valuation of Opportunity Fund assets. Contact [email protected] if you're interested in signing on to our comments to the IRS or for more information.